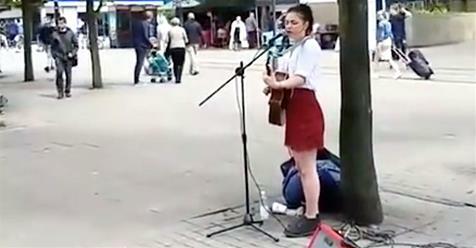 For a lot of musicians, playing music on the street is the start of their career. For this young lady, not only did she gather a crowd, but she got the attention of English singer-songwriter Seal. So much so, that he was enthralled to walk up to her and have a serious conversation about what she wants out of her music. You can tell he has a huge amount of respect for street musicians and what they do, from the video below to the time he performed a beautiful rendition of “Stand By Me” with a Canadian street busker. He later goes on to ask this young street performer, Poppy, if she’d like to do a song together. Seal could tell that she had a reggae-like feel to her music and so he mentioned Bob Marley’s music. They decided on “I Shot The Sheriff,” with Seal on vocals and Poppy on guitar, and they blew the crowd away. She sang the last chorus with him, and it was truly heartwarming to see such a wonderful collaboration. Being that Seal is in the public eye, it’s always refreshing to see a person of celebrity status appreciate art that hasn’t been given the opportunity to be showcased on a grander scale. Videos like these help bring attention to underground artists who have yet to make a name for themselves, but are trying to get recognition for what they do best.